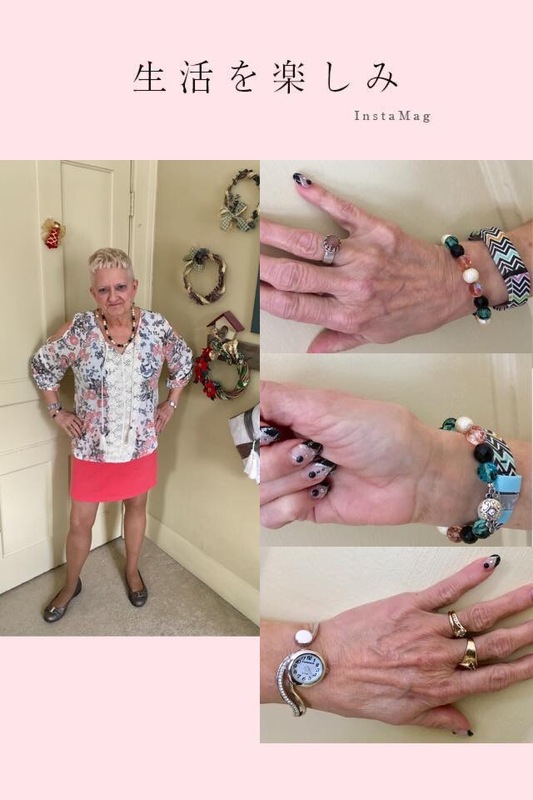 Welcome to another edition of Carol’s Corner. Disclosure: I was 90% done and somehow lost everything. Pray that is not the case this time. So let’s start with today’s pictures and move on to the real topic of tonight’s post which you can glean from the title above. Love everything about this ensemble. Bought this top recently, along with another one like it in a different color and pattern . Got them at Walmart for only $12.86 a piece. They are a really soft knit. I love the style and especially love the sleeves. So most of you know I am all about the accessories. The best part was I had all of them on hand already. The jewelry I wore with this was some I had made before, but complement the outfit quite nicely. My gunmetal flats bring out the gray tones in the top. I chose my many colored zig zag striped Fitbit band and a combination of complementary clasp covers . And my watch has just that touch of bling. I have dubbed this ensemble, ” Feeling Just Peachy”. Some call walking the “King Of Exercise” and is the most recommended exercise by doctors everywhere. People today are far too sedentary , many because they have jobs that make them sit all day, or they’re sitting in front of the tv or sitting in front of the computer. That is why we need to get on some kind of exercise regemin, one we can stick to. Walking has so many benefits and runs the least risk of injury or stress on the body. Walking can burn up to 100 calories a mile and up to 300 calories an hour. Below are just a few of the benefits of walking. The information below comes from another blog and is entitled, “Keep it Simple: 4 Reasons Why Walking Is The Best Form of Exercise”. Walking is gentler on the joints and kinder on the heart, unlike running which puts pressure on the knees and joints. Moderate intensity walking works all the same muscle groups as vigorous intensity running, and has many of the same benefits. Studies have shown that it reduces the possibility of heart disease by 4.8% more than running. Regular walking has also shown to decrease the risk of chronic illnesses such as Type 2 Diabetes and Asthma and also lowers the chances of developing Osteoporosis. It’s suitable for all ages and fitness levels, and requires nothing more than a suitable pair of running shoes. Walking is one of the few forms of exercise that doesn’t involve an expensive gym membership or classes or expensive pieces of equipment. You can walk anywhere as long as you have your pair of walking shoes. You can take long walks or short walks, whatever you can fit in on your daily schedule. It’s all up to you. As well as the physical benefits of walking, it’s good for your state of mind. Walking releases stress reducing endorphins into your bloodstream. A brisk walk boosts your circulation and oxygen supply, helping you to feel more energized. Outdoor walking will also help boost your Vitamin D levels, which aids in keeping bones strong and developing a strong immune system. Regular exercise also promotes better sleep quality , meaning you’ll wake up feeling more alert and energized for the day ahead. This is for all you “Greenies” out there. Walking instead of driving helps reduce pollution levels, thereby ensuring better air quality. It’s also a great way to connect with nature and enjoy the countryside. I know I miss all the outdoor walks I took in the spring-fall. Until springtime comes again, I will have to be content with my indoor walk workouts. Here are a few more links on why walking is such a good form of exercise, which you can read at your leisure. 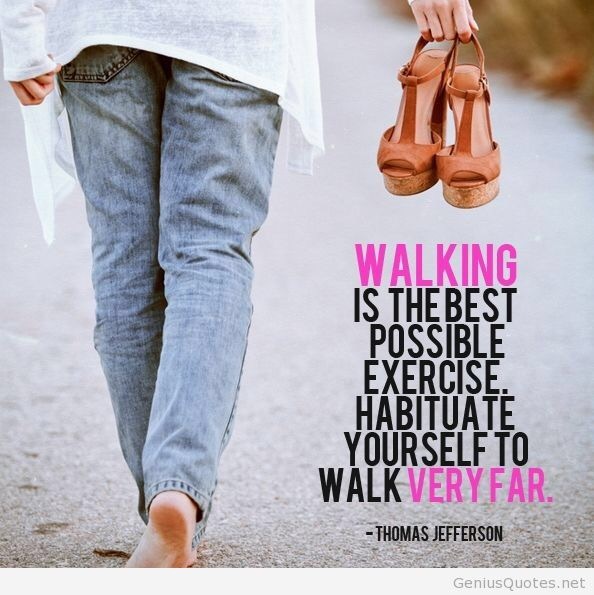 So ” Walk not Run” to get you daily dose of exercise in each day. Your body will love you for it. It’s up to you to make the time. I rarely take a rest day . Even when I say I’m going to, I usually don’t. Even a 15 minute walk has great benefits. Whatever fits in your day, just move. Please feel free to give me feedback. I always want and value it. Till next time as always, God Bless. I am a Christian Doc who just blogged about weight loss. I love it when God’s people use God’s word and God’s power to accomplish something great! Thank you for your comments. Will Check it out in my free time.